Golf cart enclosures designed by and Built For Club Professionals. That was our motto when we started in 1989 and continues to be a cornerstone of all the products we develop for the golf car industry. Innovative, sleek designs to help improve the efficiencies and/or effectiveness of golf course operations. 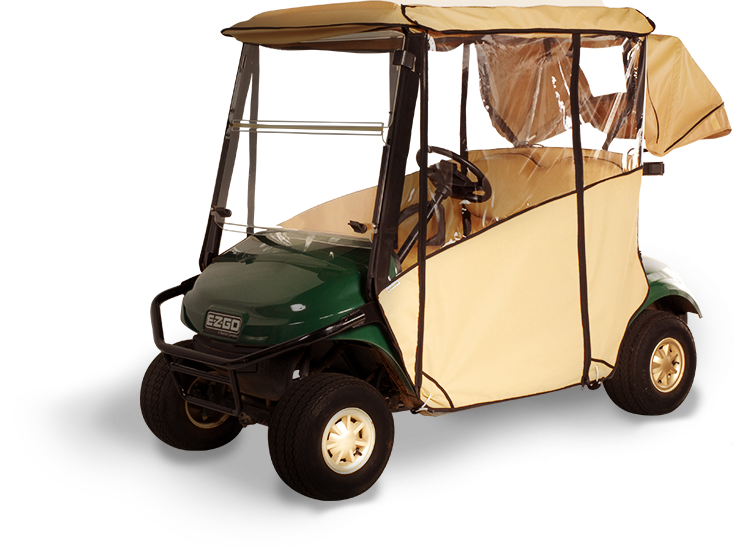 Enclosures and Cab Systems designed for Club Car vehicles. 2-Passenger and 4-Passenger options available. Our Precedent Enclosures also work perfectly on the Onward vehicles. Click below to see our options! Enclosures and Cab Systems designed for E-Z-GO vehicles. Several options for either the TXT or RXV vehicles. Some options are available through E-Z-GO exclusively. Click below for more info! Enclosures and Cab Systems designed for the Yamaha Golf Car vehicles. Offering over-the-top enclosures, 3-sided enclosures and Cab Systems for the Yamaha Drive and Drive2 models. Click below to see our options!